Great recipe and instructions. This is so much easier and better than the French version. Weighing your ingredients is the way to go. Rise evenly…slightly lopsided. Could you advise why? p.s. I also let them sit out for a hour and my apt is quite warm. I think this was the most important. First attempt I put them right in the oven, tops cracked completely. Temp too high? Macaron too big? Nest attempt a little better. Last attempt, SUCCESS. I put some saffron in the sugar syrup for some natural color. Didn’t color much. I used the remaining in the pan for a white chocolate ganache. Next problem, how to store them for 2 days. I know it depends on how big the macarons are when piped, but can you give an estimate on what the yield is given the recipe measurements? Thanks. LOVE this recipe. Thanks so much. I’ve made about 10 batches of macarons, using various recipes. This one is by far the best and easiest. This is by far the best recipie I’ve used, I actually halve everything and make half batches which turns out fine. Leaving the unbaked macarons for about an hour before baking makes the feet bigger and the whole thing shinier, I think. 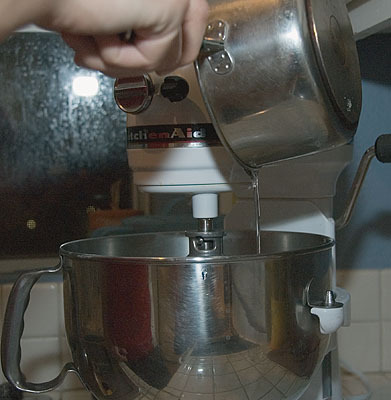 The problem i have is that i am using an electric over that has to have both the top and bottom on if i am baking (Terim Italian Ovens) i am not sure if the heat should be from the top, bottom or both… i have done some research and it sayd bottom heat is the best… any advice? I just made these. Turned out really well. I think I need to learn my oven temp better since there were some air pockets but on the whole, the recipe was great! Can’t wait to try variations on flavors. 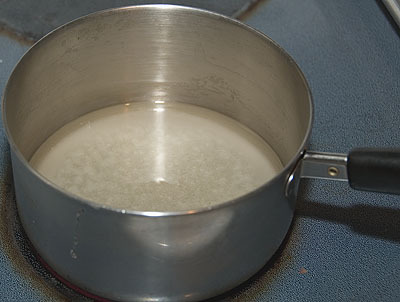 Lele: I take the almond and sugar mixture and mix the unbeaten egg white into it. 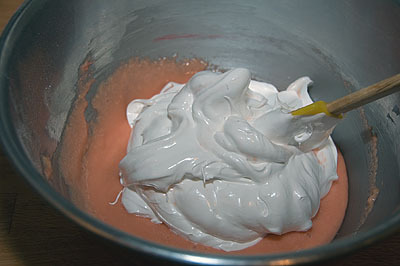 Then I fold the meringue into that mixture. Rachel: Unfortunately all the recipes I have and use are in grams. You can convert them to ounces but I would advise against trying to convert it to cups/teaspoons. There’s a level of precision you just can’t get using weights versus volume measurements. Lucy: Who’s recipe are you using? Italian meringue or French? It sounds like the macarons aren’t rising at all in the oven. Link me a recipe and I’ll see what I can do. Milana: Have baked macarons and cracking; yep, I’ve seen it. 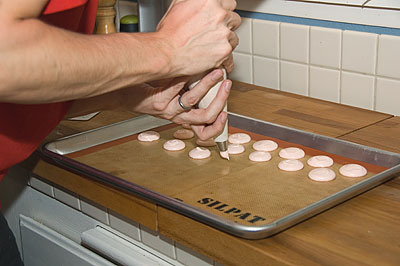 Drying your macarons before baking will give you a little insurance while the feet form. You could try letting them dry a little bit longer, maybe 30-45 minutes and then baking them again. What sort of baking pans are you using? They sound like they could be a little bit thin, try doubling up the pans and see if that works. That will give the tops a little more insurance to dry out so the feet can form without causing all the cracking. I’am having the hardest time. Everything looks perfect batter, meringue even when they are partially baked. Somthing happends half way into baking some collapse mostly look like they have “feet” only from one side and crack at the top, however the cracking issue I think I have figured out with drying them for about 15min before baking.I have studied every video, tutorial you name it and of course read the famous Syrup and Tang and still cant make these cookies. I have tried about 10 different recepies and still nothing. Somone PLEASE HELP. I thought it was my oven but I dont think so because they taste amazing except they look awful. 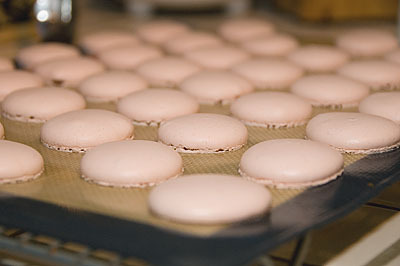 I have a thermador oven and have played with temperature seems like the closest that I can get to the real thing is at 315 F.
I’m having so many problems making macarons that it now appears to be impossible in my hands. 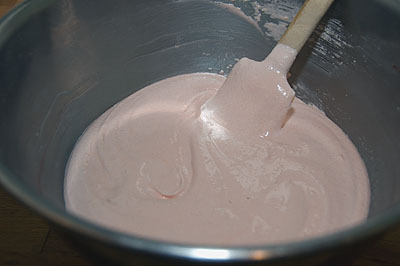 The batter looks near perfect, not liquidy at all. Yet after baking, the macarons look like flat pancakes. Not sure what I’m doing wrong – I’ve studied every video I could find and read every recipe online. Why do you think that is? Can also have the us conversions to your measurements? This probably sounds like a silly question but, when it says “Mix the remaining 60g of egg whites and the sifted almond/sugar and carefully fold into the meringue.” Do you mean to beat both the remaining eggwhites and sifted almond/sugar into the already beaten egg whites, beat it seperately then fold it in, or just fold it in..
even though it contains tapioca starch. There are a lot of pictures and troubleshooting answers. Doubling or halving the recipes for french cooking, is NEVER a good idea. has very nice measurements that can be used to approximate cups and tablespoons. you will have many many problems. Mix the dry ingredients first you can’t go wrong. No recipe was foolproof. And a combination of the three worked perfectly. tutorials on youtube.com Goof luck and good baking. I tried your base recipe, flavored with grapefruit zest, and it worked great for me! And I have had many failures in the past. One thing I had to learn was how pipe macarons properly (tips: hold the pastry bag totally straight, start with the tip almost touching the cookie sheet, count “1, 2, 3, stop” to get them to come out uniform). Does the photo show a flavored version, or is it exactly the recipe as given? Thanks for the site. I tried this recipe and just couldn’t get it to work out. My macarons rose but slipped over to one side on their “foot” if you understand what I mean. Any idea what I am doing wrong? It’s very very frustrating!!! how many macaron does this make? If you’ve never made macarons before or have never got them to turn out correctly, I would suggest NOT changing the recipe or even doubling it. Mixing that much meringue takes a bit more skill than the small amount that I have here. The mixing part of this recipe is the most important. Mix it too much or not enough and you ill not get correct foot formation. 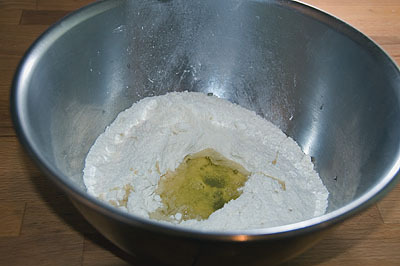 Test out your mix by placing a small teaspoon worth of batter on a plate, it should slowly spread but not be completely liquid. Some sort of pasty bag is imperative to get these guys to form correctly. If you don’t have a pastry bag, a ziplock bag with the corner cut off will work in a pinch. I will try to get a new step-by-step post up with more detailed mixing directions soon. Thanks to everyone for trying this out. Still waiting for S.O.S.. anyone here can give me a solution pls……. I spent a whole year as an exchange student in Kyoto Japan, and I have to say I probably wouldnt have survived if it werent for a cheap bowl of udon a couple of times a week! There is even one shop where you can eat for free if you do 30 minutes of washing after, but I cant say I was ever that poor! Anyway, I found a load more tasty looking ideas at this udon recipe site. hi, i’ve just tried baking (half recipe), turn out top cracked, n no “leg” formed, i’ve no idea where went wrong, please advice! thanx! I have to say…thank you very much! After five attempts with several other recipes…this is the only one that actually worked! Bravo…mine are still drying on the kitchen table. Added a bit of vanilla and that was very nice, family is now addicted to Macarons!! Thanks, now we can be happy & fat!! Thank you! Your recipe is the bomb! This is my second try, first try was with another recipe and ended spectacularly bad. Your recipe was perfect the first time out! Thanks again! Hi all. Just wanted to say that this recipes works perfectly and I’m a novice as you can get!! The macarons turned out beautifully as well as super tasty. Thanks for a brilliant recipe and great pictures. i used a handheld electric whisk and it worked perfectly! Thanks for sharing your recipe and demo macarons. Can I reduce sugar in recipe. They’re too sweet for me. At one point do you add food coloring or gel paste? What is the recipe for the filling of the macarons? you absolute star, i did a tasting for a job & on my first attempt got the macarons perfect, now i have won the job for 1650 of them my recipe failed me, all day long i tried everything to no avail, then i got your method & hey presto perfect macarons. Wow! your macarons look delicious! How do you prevent your macarons from tanning? This is def. the BEST macaron recipe I have tried!!! thanks!!!! Can I use an instant thermometer instead of a candy thermometer? These Italian Meringue ones are a little sweet due to all the extra sugar in the meringue. They’re a different beast than French Meringue macarons but I wouldn’t say they were better/worse.